Alan Campbell had been sleeping rough in Leeds before his death in October 2017. In the first part of a series on homelessness in Leeds, the YEP reflects on the lives lost on the city’s streets and why more scrutiny of those deaths is now needed. The deaths of rough sleeper Alan Campbell and others who had been living homeless in Leeds over the nine months did not go unacknowledged. There were flowers laid, candles lit and tributes paid for some, while police appeals and inquests brought the passing of others to the public’s attention. None were deemed to have died in suspicious circumstances, so files duly made their way to the coroner tasked with establishing the circumstances and cause of each death. But, crucially, there has been no detailed examination to date of what attempts were made to help these people off the streets and whether more could have been done in the weeks, months and years beforehand. The scene of the vigil held for Alan Campbell and 'Geordie' after their deaths last year. Gordon Laing, general manager of rough sleeper charity Simon on the Streets, believes such deaths needs to be scrutinised in the same way as those involving abuse and neglect. “We consider every single one of our service users to be incredibly vulnerable,” he said. When Alan’s mother received a call last October to say her son had died, she had not seen him for seven years. Tents and sleeping bags have become a familiar sight in shop doorways in Leeds as the number of rough sleepers contineus to grow. The inquest heard how Alan, a 42-year-old born in Stirling, Scotland, had been admitted to St James’ Hospital on October 10 and died in the intensive care unit the following day. It concluded he had died from opiod overdose, severe sepsis and rhabdomyolysis – a condition which causes muscle damage. In the days following his death, a poignant memorial was held for Alan and another homeless man known as ‘Geordie’ who died the week before. It took place in Neville Street, where Alan often slept and had become a familiar face to people passing by each day. There was a similar outpouring of tributes in late December when Nigel Whalley died. Described as a “true gentleman”, the 50-year-old would often stand outside the Merrion Centre and was known for coming to the rescue of mothers struggling down the steps with their pushchairs. One of 11 children raised in Seacroft, he had become homeless after the breakdown of a marriage and left behind a son. Within weeks of his death, 56-year-old Fiona Watson was found dead on Neville Street, a short distance away from the site of Alan’s memorial. She had an address in Hunslet, but seems to have been sleeping rough on the night before she was found dead. 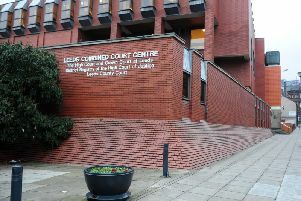 Since 2015, Leeds Safeguarding Adults Board (LSAB) has been required to carry out a Safeguarding Adults Review (SAR) if there is reasonable cause for concern about how the board, its member organisations or anyone with relevant functions worked to safeguard an adult and that adult died – or is suspected to have died – as the result of abuse or neglect. Reviews can also be conducted if the adult is still alive, and the board knows or suspects that they have experienced serious abuse or neglect. While many would argue the homeless are some of the most neglected people in society, not a single review has been conducted in Leeds concerning adults with care and support needs who have been homeless. However, this is set to change later this year as the board undertakes its first ever review into the safeguarding issues surrounding homelessness. He revealed the board will also consider a recent report by national charity Crisis which called for SARs to be carried out whenever a person dies while homeless and on the streets. Martin Paterson, development director at St George’s Crypt in Leeds, agrees the review could be crucial. “I think anything that will improve safeguarding systems for people who are among the most vulnerable in our society has to be welcome,” he said. To report a safeguarding adults concern, contact adult social care on 0113 222 4401 or 07712 106 378 (out of hours).